Secular campaigners have criticised the armed forces for funding military chaplains, and want churches to fund them instead. The MoD revealed, after a Freedom of Information request, that it costs taxpayers £22m a year to support about 280 Christian padres. The National Secular Society says that at a time of defence budget cuts the cost should be met by churches. The Church of England said it was not considering such a change. The chaplains work across all three services, and are drawn from the Church of England, the Roman Catholic Church, and the Methodist Church among others. There are also five civilian chaplains, who minister to Hindu, Sikh, Jewish, Muslim and Buddhist recruits. 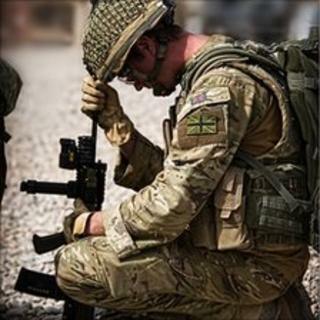 An important part of the chaplains' role is to offer spiritual support to forces personnel based in conflict zones who are dealing with highly stressful situations. They are not required to fight, and do not carry weapons. As well as one-to-one support, they lead prayer services, including memorials for personnel killed in battle. Yet in the case of the Army, the MoD says that a quarter of chaplains cannot currently be fully deployed to the frontline because of medical issues. In practice, this means that some may not be able to travel abroad with their regiments, while others can travel but not to forward bases. The MoD said that despite this all chaplains continue to provide support to wounded soldiers and bereaved families, wherever they are based, and that some who cannot travel now, may do so in the future. "It should be borne in mind that many of those who have been medically downgraded will return to be fully deployable after treatment," a spokesman said. "The army supplies 80% of the chaplains in Afghanistan. Non-availability of chaplains for medical reason has not compromised the chaplains' department's ability to ensure that chaplains are deployed where required." The National Secular Society (NSS) says that as the Armed Forces already have access to taxpayer-funded professional services, such as counselling, religious organisations should pay for spiritual services. However, NSS spokesman Stephan Evans said his organisation was not necessarily calling for an outright ban on all spiritual support to personnel. "There could be a diminished role for religion, for example, taking some religious services." The NSS is writing to defence minister Andrew Robathan to ask that either churches assume funding of their chaplains themselves, or that the MoD converts the role of chaplains into a more general "pastoral care" function, for which anybody can apply. The Church of England, which provides most of the chaplains, said that the service they provide, which they characterised as giving spiritual support in the face of death, was unique. It confirmed that was not currently considering funding its military chaplains.